The Portfolio Protector is a professional money management solution that allocates assets into an invested, partially invested or defensive position according to Absolute Capital’s market analysis. The Portfolio Protector is suited for investors who want to attempt to add an element of risk management to their investments. These investors are looking for a plan that emphasizes avoiding large declines in the market while also seeking to participate in the market’s appreciation. 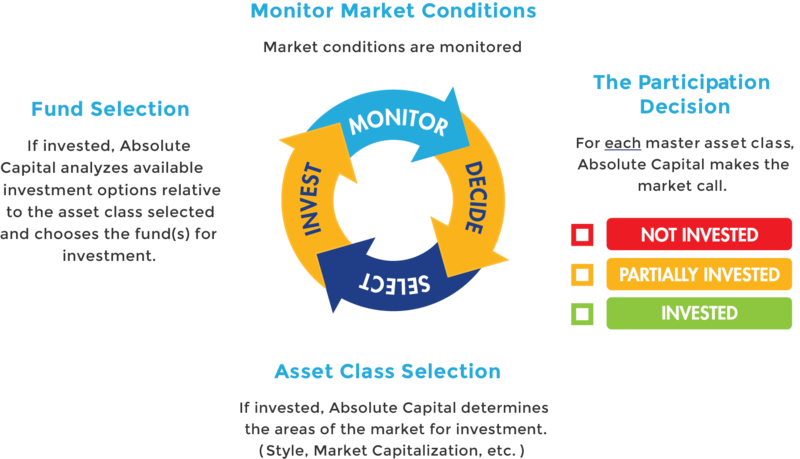 Active management strategies, such as The Portfolio Protector, monitor economic and market variables in order to move your money in and out of the market. The Portfolio Protector interprets market data in an effort to identify favorable and unfavorable market conditions based on our analysis. The goal is to be fully or partially invested during periods where Absolute Capital’s analysis indicates favorable conditions, while being out of the market or in defensive positions during periods where Absolute Capital’s analysis indicates less favorable conditions – in an attempt to help avoid large losses. This strategy may not be suitable for all clients. There is no guarantee that any investment strategy will achieve its objectives. Active management, asset allocation and/or diversification do not guarantee a profit or protect against loss.